Over the past few flu seasons, when people would catch the flu, everyone one in our group had the same symptoms. One year we all had the Hong Kong flu with the stomach cramps and diarrhea. Then, the next year, we would all be coughing our heads off and trying to avoid bronchitis. But in the Swine Flu in 2008 have had very different symptoms that were all over the map. 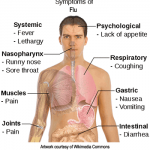 The H1N1 – Swine flu – is a combination of three different types of flu (Swine, avian and human), which explains why people are having a wide range and severity of symptoms. Those who have been severely ill have experienced tremendous fatigue and weakness which can last for weeks. Some people have had more gastrointestinal issues and felt depleted. 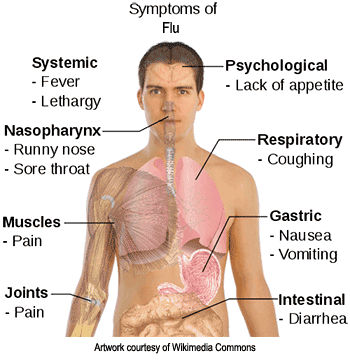 Others have had the flu quickly turn into bacterial pneumonia with exhaustive spells of coughing that lasts for weeks. Regardless of which symptoms that you have it is important to be proactive with your health if you think you have caught the flu.